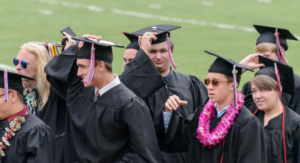 If the strains of Elgar’s “Pomp and Circumstance” didn’t cause my throat to constrict during my son’s recent high school graduation ceremony, the sight of 180 teens marching in neat lines of two across, dignified in their black graduation robes and caps sure did. As far as graduations went, it was your typical, garden-variety affair. Held outdoors on the football field, the beauty of the Santa Cruz Mountains flanking the campus, we listened to the usual opening address, followed by songs, speeches, recognition for award recipients. 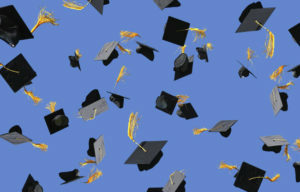 Hats off to the graduates who garnered awards. You surely deserved it and your efforts have been duly noted and fêted. Valedictorians, Salutatorians, Principal’s Award recipient, National Honor Society member, Top 10 Students. And so on. That’s not the group, however, to whom I dedicate this blog. I am a member of NAMI—the National Alliance on Mental Illness—and I participate in a local support group and its accompanying online discussion forum. Other members of this group are parents such as my husband and myself, who have needed support through our kids’ tricky adolescent years. The group, its supportive presence and collective wisdom, has been a life saver to me, a rope flung out in turbulent waters that just about pulled me under a few years ago. I’m unspeakably grateful for the group, its members and their own stories. Difficult situations abound. Life gets real here. Prior to parenting, in my early thirties, I glibly thought all kids graduated from high school. Well, certainly kids of well-adjusted parents with college degrees and a stable, loving home environment. You do everything right, the kid will turn out right. Right? I can hear some of you laughing out there. Silly, deluded Classical Girl. Life, as well, sort of chuckled at my naïve attitude and murmured, “Boy, do you have something to learn.” So Life went about teaching me. Illuminating me. The past eight years, if not the past eighteen years, have forever changed me. Humbled me. Opened my eyes to all the different, subtle ways, all of us—kids and parents alike—struggle. And when your kid is not neurotypical, or is struggling with a mental illness or behavioral differences, or something scary and undiagnosable, all the rules of parenting get thrown out the window anyway. 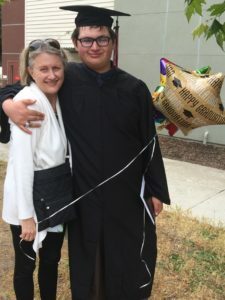 What seemed impossible to consider two and three years ago—my son pushing past his challenges to graduate from high school—took place this month. And, oh, the pride I felt, the relief, the thorny, crazy wisdom. The bittersweetness. Because not all my NAMI friends and fellow parents have been able to achieve this milestone. Good kids from good families sometimes have to drop out of high school. Debilitating anxiety. Physical illness. Mental illness. Scary, turbulent behavior that risks tearing the family apart. Eating disorders. Self-harm. Suicide ideations. Suicide attempts. The escalation of any of the above, mandating residential treatment. Attaining a high school diploma becomes secondary in importance, often shelved, temporarily out of their reach. On graduation day, I watched closely as all my son’s classmates’ names were called out and they stepped up to receive their diplomas. Each and every one touched me. I understand now that every last one of those kids had a story. Every one of their parents had a reason to feel proud. We may never know the other guy’s story. If it involves something like anxiety or mental illness, quite possibly we won’t ever hear the story. There are no awards for having gotten out of bed every morning and gone to school, even though, for some teens, it was like scaling Mt. Everest daily. Some teens went through periods of wanting to kill themselves. Some tried. Families tend not to share that. You just never know. Those are my heroes. Those kids. The quiet-looking ones (or not) who didn’t garner awards and accolades (or maybe they did. Reminder to self: you just never, never know). They did this. They achieved this milestone. Here’s to you, heroes of the graduating class of 2017, for all your efforts, the barriers you overcame, to arrive at this place. And to your parents. I raise my glass high to you all. And to my son, I am so very, very proud of you. PS: if you are a parent struggling with this kind of situation and don’t know where to turn, please, please reach out to me, via my “contact me” page, or get in touch with your local NAMI chapter. There IS help for you and your child. You are NOT alone. I promise. This entry was posted in Life and tagged adolescent mental health, graduating from high school, inspiration for teens, mental health awareness, NAMI, National Alliance of Mental Illness, overcoming obstacles to graduate, stories of overcoming mental illness, teen anxiety, teen self-harm, teen suicide on June 19, 2017 by admin.